This is a picture of Bug's hang-up clothes from last year. You can actually see the $2 dress in this picture - it's the short-sleeved green, purple and blue dress. All of these clothes were hand-me-downs, gifts or garage sale finds. The great thing about kids is that they're generally not picky about the clothing they wear. The bad thing about kids is that the grow out of their clothes in the blink of an eye. And for some reason, most people expect you to clothe your little one. I'm going to share all my tips and tricks with you so you can get the most bang for your buck when it comes to clothes for your kids. The first step to saving money is deciding how much you really need for your little. Bug's clothing needs have changed over the course of her short lifetime. When she was a baby, we preferred to dress her in sleepers rather than a shirt and pair of pants. As she's grown older, we've ditched sleepers for two-piece outfits for the purposes of potty training. We don't keep a count for undies and socks, but generally speaking, we aim for 4 pairs of socks and 10 pairs of undies. Honestly, Bug wears socks very minimally. Bug doesn't wear shoes very often, but she has a pair of TOMS that matches our TOMS, a pair of sandals that can get wet, and a pair of sandals to wear with dresses and dressier outfits. I don't really worry about shoes for the future, but I imagine she'll have a pair of TOMS for each size and a pair of sandal-type shoes. When she's old enough to add fitness as a part of her lifestyle, she'll have a pair of shoes for that. Depending on the region of the world in which you live, your list of what your child may need for clothing can definitely vary. If you live in a very hot climate, you may want some sleeveless tops for your child. We don't make it a point to buy that type of item, but Bug has a couple of tank tops. Once you've determined the bare necessities your child needs, and the keyword here is what is actually necessary, you can start shopping for your child's wardrobe. Bug is currently in size 24 month/2T, and we have 3T completed. We also have some clothing items for 4T and even 5T. You'd be shocked at how many incredibly nice clothing items we've received for free. Our friends have given us many bags of clothes, including many pairs of shoes. Family members who have daughters and granddaughters have happily given us clothes for our Bug. A good chunk of Bug's 3T items were completely and absolutely free. Ask around to those who have kids, even if they're many years older than yours. You'd be shocked at how many of them still have clothing in littler sizes. If they're past a child-bearing age or have decided not to have any more children, they may be happy to pass along the clothes to you. I've spent many a happy afternoon sorting through clothes given to me and keeping what I liked and passing on the rest. It was like shopping, only it was free. If someone you know is giving clothes to you for free, it would be a nice gesture to make cookies or muffins for them or offer a night of free baby-sitting. If Christmas or your child's birthday is coming up, and you're a little short on clothing items, don't hesitate to let friends and family members know what your child needs. For Bug's first Christmas, we let everyone know which 24 month items we were in need of. For all subsequent Christmases/birthdays in the near future, I don't foresee us needing any clothing items. In fact, I already asked my mom not to buy her any clothes because we need nothing. More clothes would actually be a bother because we have too many as it is. But when you're in need of clothes, family and friends are usually all too happy to shop for clothes for your little. My love for shopping really comes in handy when it comes to garage sales. I can get great bargains on awesome clothes. I find the majority of the garage sales I hit up on craigslist.com. I click on garage sales. If I'm not wanting to travel far to save on gas (which is often), I type in my hometown in the search bar to limit sales to only my area. Thankfully, I live near a ton of towns so just by driving 15 miles, I can find a lot of good ones. I only pick out ones that specifically list girls' clothes for the sizes I'm looking for so that I don't waste gas or time. Once I have a list of garage sales, I map out the best route on mapquest.com. This helps save gas and time, too. The best garage sales are subdivision sales because you can hit a lot of houses very quickly. I typically strap Bug in her umbrella stroller and walk the entire sub. Not only am I getting shopping done, but I'm getting a good walk in, too! You can read a lot more in detail about garage saling here and here. Part of what I cover there is the cost I'm willing to spend at garage sales. Typically, I'm unwilling to spend a cent over $1 for any clothing piece. When Bug was born in March 2013, we started garage saling in April that year. I remember I bought her the cutest dress and hat ensemble at a garage sale for $2. That is way more than I normally would spend. Every time I went to dress her when she was in that size if the dress was clean, she was in it. And I always told her, "We've got to get our money's worth out of this dress. It cost $2!" Jason thought it was going a little too far (I admit to nothing), but I learned an important lesson. If it bothered me that much to spend $2, I should've passed on it. There will always be another dress. My limit is generally $1, with the exception of jackets/coats. I prefer to spend less than that. 50 cents a piece is much more my range, and I've even been to a garage sale where I stocked up on colored onesies in fantastic shape for 10 cents each. That was a red banner day in my book. You'll always want to be sure to have your list with you, whether you're going to garage sales or sorting through free clothes so that you know which items you need and which ones you don't. I'm not the best role model for this, I fully admit, but you don't really need more than 4 dresses. Generally speaking, there are only 4 Sundays in the month, so if you're a church-going family, you're covered. And if you don't go to church, I'm not sure your daughter will have 4 occasions in the month to wear a dress. There's a lot to be said for owning less when it comes to your child's clothes. 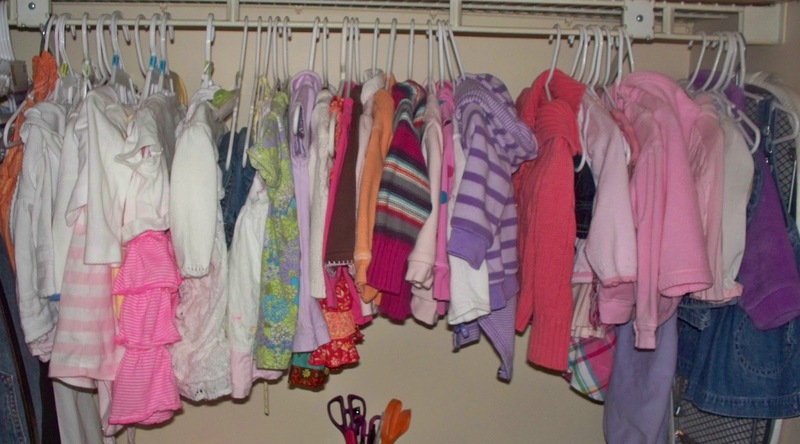 If you plan to store your child's clothes for the next little who comes along, less clothes will take up less space. You'll have less laundry that can pile up. Your little will need less dresser and closet space in which to store their clothes. Once you've mastered your little's wardrobe, consider taking a look at your own. Everything that is true about having less for your little is true for you, too. Having less really is better!